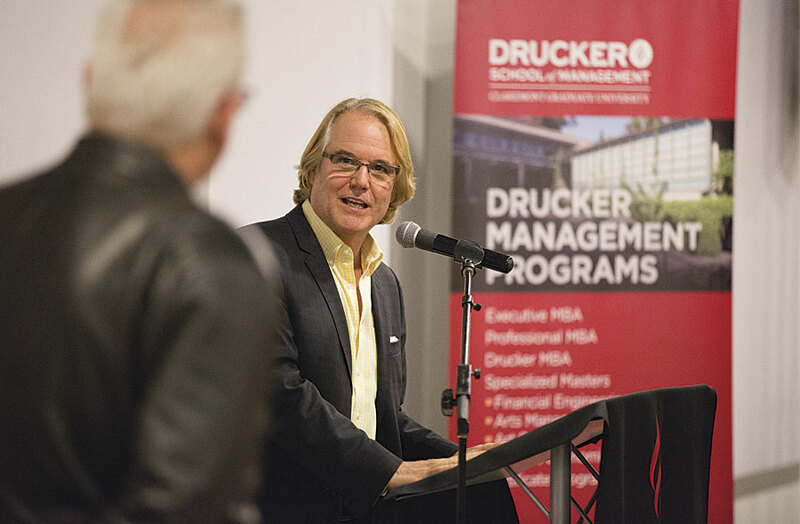 In the spring of 2012, Thomas Horan, dean of the Drucker-Ito School of Management at California’s Claremont Graduate University (CGU), found himself at dinner with the late James Oberstar, a former United States Representative for Minnesota, and Matt Rose, then CEO of the railroad giant BNSF Railway Company. Something of a debate took shape. Oberstar, who served for four years as chairman of the Transportation and Infrastructure Committee, asserted that greater public-sector investment in the United States’ freight-rail infrastructure was needed and that such support deserved to be recognized as an essential economic driver. Rose countered that private-sector investment in moving goods and services by rail was more critical to economic progress. 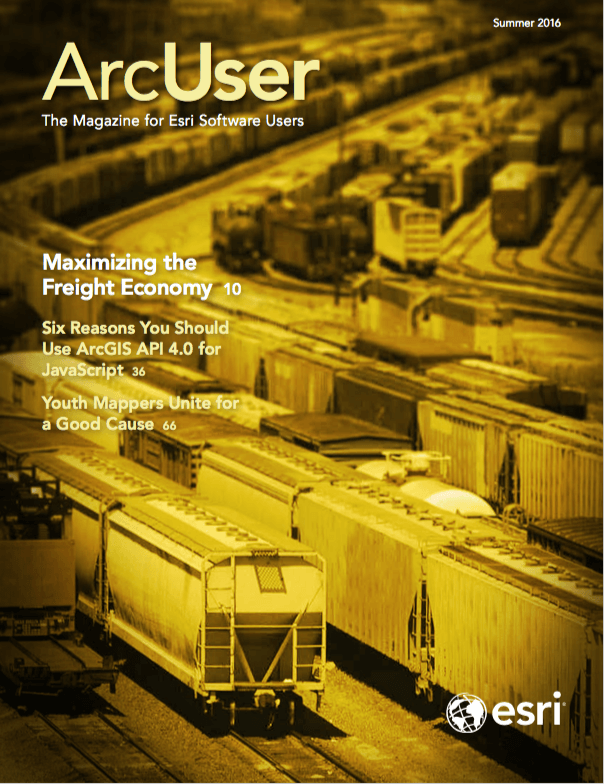 As the conversation progressed, the three agreed that an easily accessed information source—one tailored to an audience that could include legislators, business leaders, and freight analysts—was needed to foster a greater understanding of the United States’ freight infrastructure, its effect on the economy, and the value of both public and private investment in freight-rail capacity. 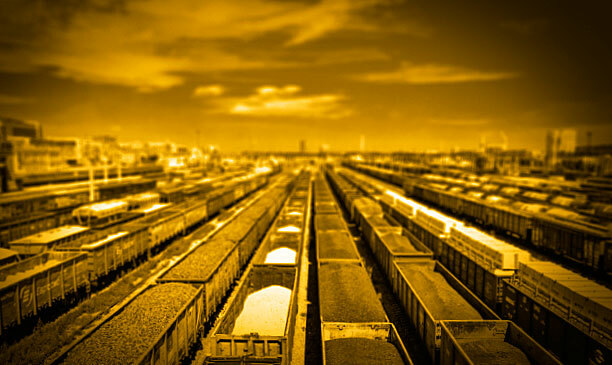 Such a tool, they theorized, could also improve private-sector comprehension of the potential of freight rail and create opportunities to improve the freight-rail infrastructure by identifying efficiencies and weaknesses in the movement of goods. 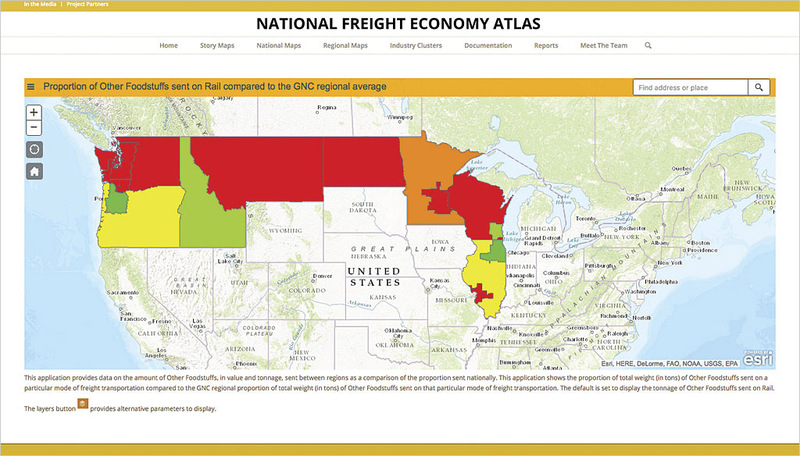 That moment of inspiration has led to the National Freight Economy Atlas, an ArcGIS-powered online resource developed by a partnership that includes Claremont Graduate University, Esri, and the University of Minnesota, with financial backing from BNSF Railway and the State of Minnesota. 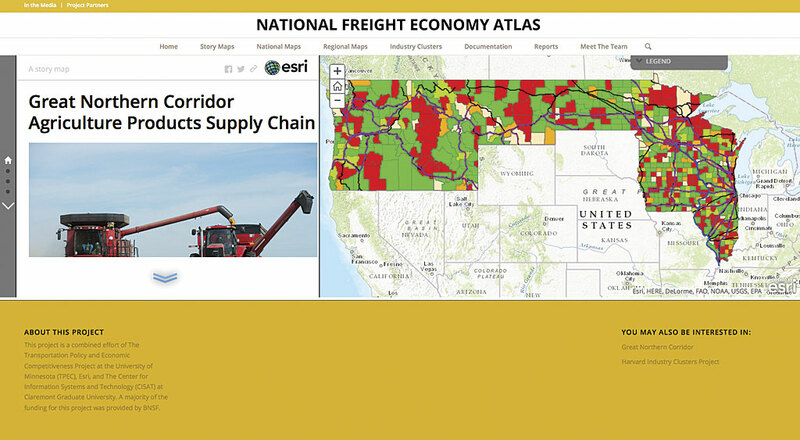 With a menu of interactive maps, the atlas illustrates relationships between commodity sources and the United States’ freight infrastructure and offers tools to gain an improved grasp of concepts like industry clusters—sets of interconnected stakeholders within a geographic area—and location quotients, economic ratios comparing regional attributes to those of the country as a whole. Prior to his work with the National Freight Economy Atlas, Horan had already earned a reputation for creating innovative platforms with which to share critical data with the public. In 2008, he codeveloped, with CGU professor Brian Hilton, the website Safe Road Maps, which presents mapped data—state by state and even street by street—on traffic fatalities and auto accidents. [See “Mapping Roadway Fatalities—Website increases awareness and understanding” in the summer 2012 issue of ArcUser.] By simply zooming in on a particular geographic location, site visitors can call up historical information on accidents that have occurred along a particular route, allowing them to gauge travel risks. Demand for such information was so strong, Horan said, that on the site’s launch date, several additional servers had to be brought online to handle the unexpected user volume. To date, he estimates, the site has earned more than 15 million hits. 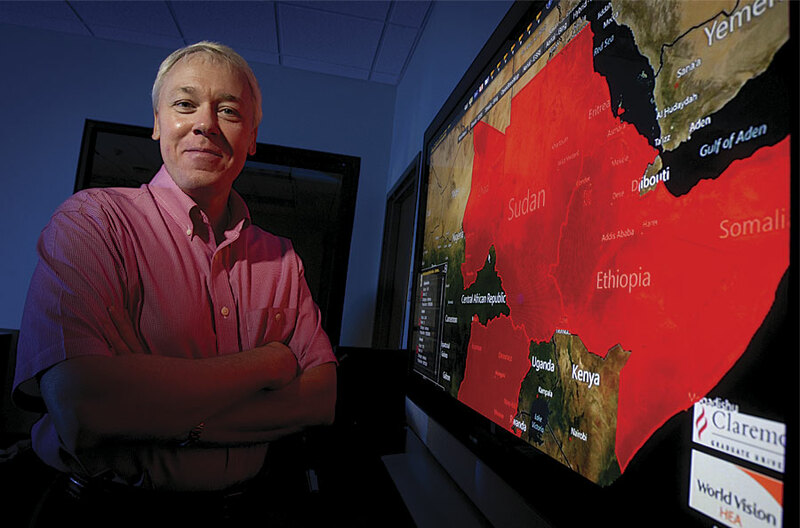 Work on the National Freight Economy Atlas, began within a GIS practicum course—in which students develop GIS-based solutions for real-world challenges—at Claremont’s Center for Information Systems and Technology (CISAT), then moved to the Advanced GIS Lab at CISAT, headed by Professor Hilton. Using data from the Bureau of Economic Affairs, the Freight Analysis Framework (produced through a partnership between the Bureau of Transportation Statistics and Federal Highway Administration), and the 2012 United States Census Commodity Flows Survey, the atlas identifies major industry clusters within a state and uses location quotients to provide measurements of a state’s industrial specializations. That data is depicted in relation to local freight-intensive routes that lead to major freight-rail corridors. The resultant analytical picture, Hilton said, provides a “specialized understanding of commodity movements within and between regions.” Using United States Department of Transportation data, the atlas goes further, identifying the proportion of a region’s production associated with freight movement and helping create a picture of the economic impact of that freight traffic. Next, Horan hopes to expand thr National Freight Economy Atlas‘s scope to include data and analysis of other transportation modes, beginning with air freight. He and his National Freight Economy Atlas collaborators have been working with Federal Express on strategies to illustrate the value of the air-freight infrastructure in moving high-value, low-weight products. Given the fundamental nature of supply chain and logistics—fields devoted to moving goods over distances—Horan foresees moving past a stage at which GIS fuels operational research and into an environment in which the tools of geospatial analysis are ubiquitous across the shipping industry. GIS, he contends, has the potential to conquer what the renowned management theorist Peter Drucker—the “Drucker” in Claremont’s Drucker-Ito School—regarded as one of the business world’s greatest challenges: attaining a full comprehension of the science of moving goods.